I am sucker for Thanksgiving dinner. I like all the classics, but I don’t necessarily like some of the ingredients in the classics. 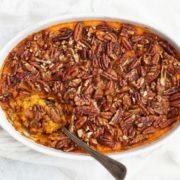 This recipe can easily be made dairy free by substituting almond milk and coconut oil instead of butter, and who needs marshmallows when sweet potatoes are already packed with sweet deliciousness? As for Thanksgiving traditions, we have a felt gratitude tree with a pocket for each day of the month that we hang in our house every November. Throughout the month we take turns writing down things we are thankful for, and then we read them at dinner on Thanksgiving day. Bring an inch or two of water to a boil in a large pot fitted with a steamer basket. Add sweet potatoes, cover and steam until very soft, 18 to 20 minutes. Remove basket and discard water. Return sweet potatoes to the pot. Add milk, 4 tablespoons butter, salt, vanilla, ginger, cinnamon and pepper; mash until desired consistency. Transfer to a 1½-quart baking dish. Stir pecans, pepitas, dried fruit and the remaining 1 tablespoon butter together in a small bowl. Sprinkle over the top of the sweet potatoes. 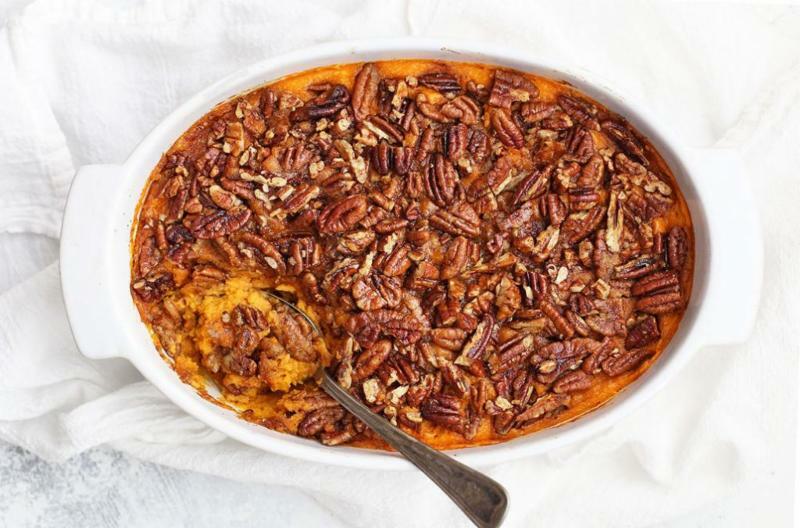 Bake casserole until hot and the nuts are lightly toasted, 20 to 30 minutes. To make ahead: Prepare through Step 3 and refrigerate for up to 2 days. Join us for our Tao to Wellness Detox and Cleanse program! Chinese New Year Dos and Don’ts! Please enter the characters you see below.